Washington & Jefferson College (W&J College or W&J) is a private liberal arts college in Washington, Pennsylvania. The college traces its origin to three log cabin colleges in Washington County established by three Presbyterian missionaries to the American frontier in the 1780s: John McMillan, Thaddeus Dod, and Joseph Smith. These early schools eventually grew into two competing academies, with Jefferson College located in Canonsburg and Washington College located in Washington. The two colleges merged in 1865 to form Washington & Jefferson College. The 60 acre (0.2 km2) campus has more than 40 buildings, with the oldest dating to 1793. The college's academic emphasis is on the liberal arts and the sciences, with a focus on preparing students for graduate and professional schools. Campus activities include various religious, political, and general interest clubs, as well as academic and professional-themed organizations. The college has a strong history of competing literary societies, dating back before the union of Jefferson and Washington Colleges. Students operate a college radio station, a campus newspaper, and a literary journal. The athletic program competes in NCAA Division III. The football team has been particularly successful over its history, even competing in the 1922 Rose Bowl. A large majority of students participate in intramural athletics. Nearly all students live on campus and roughly one third are members of fraternities or sororities. A number of noteworthy alumni have attended the college or its predecessor institutions, including James G. Blaine, William Holmes McGuffey, Joseph Ruggles Wilson, who was the father of President Woodrow Wilson, and Pete Henry. Washington & Jefferson College traces its origin to three log cabin colleges established by three frontier clergymen in the 1780s: John McMillan, Thaddeus Dod, and Joseph Smith. The three men, all graduates from the College of New Jersey (now Princeton University), came to present-day Washington County to plant churches and spread Presbyterianism to what was then the American frontier beyond the Appalachian Mountains. John McMillan, the most prominent of the three founders because of his strong personality and longevity, came to the area in 1775 and built his log cabin college in 1780 near his church in Chartiers. Thaddeus Dod, known as a keen scholar, built his log cabin college in Lower Ten Mile in 1781. Joseph Smith taught classical studies in his college, called "The Study," at Buffalo. 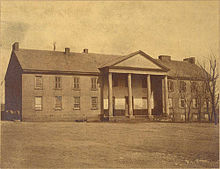 Washington Academy was chartered by the Pennsylvania General Assembly on September 24, 1787. The first members of the board of trustees included Reverends Dod and Smith. After a difficult search for a headmaster, in which the trustees consulted Benjamin Franklin, the trustees unanimously selected Thaddeus Dod, considered to be the best scholar in western Pennsylvania. Amid financial difficulties and unrest from the Whiskey Rebellion, the Academy held no classes from 1791 to 1796. In 1792, the Academy secured four lots at Wheeling and Lincoln street from William Hoge and began construction on the stone Academy Building. During the Whiskey Rebellion, portions of David Bradford's militia camped on a hillside that would later become home to the unified Washington & Jefferson College. In October 1792, after a year's delay from its official incorporation resulting from "trouble with Indians," McMillan was chosen as the headmaster and Canonsburg was chosen as the location for the "Canonsburg Academy." At a subsequent unknown date, McMillan transferred his students from the log cabin to Canonsburg Academy. Canonsburg Academy was chartered by the General Assembly on March 11, 1794, thus placing it firmly ahead of its sister school, Washington Academy, which was without a faculty, students, or facilities. On January 15, 1802, with McMillan as president of the board, the General Assembly finally granted a charter for "a college at Canonsburgh." In 1802, Canonsburg Academy was reconstituted as Jefferson College, with John McMillan serving as the first President of the Board of Trustees. In 1806, Matthew Brown petitioned the Pennsylvania General Assembly to grant Washington Academy a charter, allowing it to be re-christened as Washington College. At various times over the next 60 years, the various parties within the two colleges pursued unification with each other, but the question of where the unified college would be located thwarted those efforts. In 1817, a disagreement over a perceived agreement for unification erupted into "The College War" and threatened the existence of both colleges. In the ensuing years, both colleges began to undertake risky financial moves, especially over-selling scholarships. Thanks to the leadership of Matthew Brown, Jefferson College was in a stronger position to weather the financial storm for a longer period. Desperate for funds, Washington College accepted an offer from the Synod of Wheeling to take control of the college, a move that was supposed to stabilize the finances for a period of time. However, Washington College then undertook another series of risky financial moves that crippled its finances. The two identical towers on Old Main symbolize the 1865 union of Jefferson College and Washington College to form Washington & Jefferson College. Following the Civil War, both colleges were short on students and on funds, causing them to join together as Washington & Jefferson College in 1865. The charter provided for the college to operate at both Canonsburg and Washington, a position that caused significant difficulty for the administration trying to rescue the college amid ill feelings over the unification. Jonathan Edwards, a pastor from Baltimore who had been president of Hanover College, was elected the first president of the unified Washington & Jefferson College on April 4, 1866. Edwards immediately encountered significant challenges, including the difficulties of administering a college across two campuses, as well as old prejudices and hard feelings among those still loyal to either Jefferson College or Washington College. 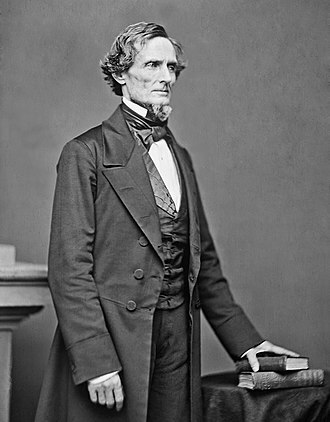 Edwards resigned in 1869, as the two-campus arrangement was declared a failure and all operations were consolidated in Washington. Before the merger could be completed, Canonsburg residents and Jefferson College partisans filed a lawsuit, known as the Pennsylvania College Cases, sought to overturn the consolidation plan. Leadership of the college during this time fell to Samuel J. Wilson, a local pastor, and James I. Brownson, who had earlier been interim president of Washington College. 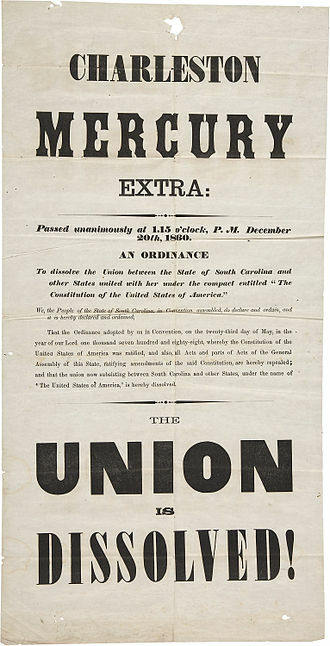 By 1871, the United States Supreme Court upheld the consolidation, allowing the newly configured college to proceed. Hays Hall, named after George P. Hays, was built in 1903 and demolished in 1994. George P. Hays, who had assumed the presidency amid the court battle and the unification controversy, led the newly unified college until 1881. His successor, James D. Moffat, led the college through a period of growth where the college constructed the Old Gym, Hays Hall, Thompson Memorial Library, and Thistle Physics Building, as well as purchasing the land known as the "old fair ground," now used for Cameron Stadium. Towards the end of his term, Moffat personally paid for the 1912 renovations of McMillan Hall. In 1914, Frederick W. Hinitt was elected president. His tenure was dominated by the United States' entry into World War I, with an enrollment drop of 50%. William E. Slemmons, a college trustee and adjunct professor, succeeded Hinitt and served as interim president from May 1918 to June 1919. After the war ended in 1919, Samuel Charles Black took over and helped to stabilize the enrollment. While on a honeymoon tour of national parks, Black became ill and died. His successor, Simon Strousse Baker, was well liked by the college's trustees and by "many a townsman", but the student body felt that Baker was "autocratic" and held an "unfriendly attitude toward the student body as individuals." Baker defended himself, saying that the perceived ill-will towards students was unintentional and a misunderstanding. Nonetheless, the student body held a strike and general walkout in 1931, prompting Baker to resign. Named after Howard J. Burnett, the Burnett Center was constructed in 1998. Baker's successor, Ralph Cooper Hutchison, was much more popular with the student body. 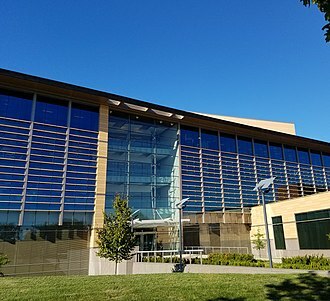 In an effort to strengthen the college's science department, Hutchison extended and expanded the southern portion of the campus, adding the Lazear Chemistry Hall and purchasing McIlvane Hall. When World War II broke out, the campus was opened to the Army Administration School, where hundreds of soldiers received their "training in classifications." Hutchison resigned in 1945 to take the presidency of his alma mater, Lafayette College. James Herbert Case, Jr., who was president from 1946 to 1950, constructed several new dormitories to handle the influx of veterans under the G.I. Bill. In 1950, Boyd Crumrine Patterson assumed the presidency and oversaw curriculum revisions and the construction of a number of buildings, including the Henry Memorial Center, 10 Greek housing units in the center of campus, the U. Grant Miller Library, the Student Center, the Commons, and two new dormitories. His fundraising abilities grew the college's endowment expanded from $2.3 million to nearly $11 million. Patterson retired in 1970, the same year that the trustees authorized the admission of women as undergraduate students. Howard J. Burnett took office as president that year and hired the college's first female faculty members and the first female dean. The college also adopted a new academic calendar to include intersession and expanded its academic programs to include the Entrepreneurial Studies Program, the Freshman Forum, and several cooperative international education programs. Student enrollment grew from 830 in 1970 to 1,100 in 1998. Burnett retired as president in 1998. Under Burnett's successor, Brian C. Mitchell, who served as president from 1998 to 2004, the college experienced a growth in construction and an effort to improve relations with the neighboring communities. In 2004, Tori Haring-Smith became the first woman to serve as president of Washington & Jefferson, undertaking an effort to improve the science curriculum and to construct the Swanson Science Center. After 13 years of service, Haring-Smith retired from her position on June 30, 2017. John C. Knapp was named Haring-Smith's successor on April 21, 2017, and became the College's 13th president on August 1, 2017. As a liberal arts college, Washington & Jefferson College focuses exclusively on undergraduate education. It is accredited by the Middle States Association of Colleges and Schools. The college's teaching environment reflects the liberal arts tradition of small group instruction by maintaining an average class size of 17 and a student/faculty ratio of 12:1. 85% of faculty have terminal degrees and no classes are taught by teaching assistants. The college has a strong science program, with 35% of students majoring in one of the scientific departments. Within those areas, all 32 professors hold terminal degrees. The most frequent class size is between 10 and 19 students. The college has a focus on preparing students for graduate school and professional programs. Across all disciplines, 85% to 90% of students who apply to such programs receive offers of admission. Among students who apply to medical school or related health graduate programs, 90% of students gain admission. Approximately 11% of all current W&J alumni are physicians and engineers, making the college third in the nation per capita for producing doctors and scientific researchers. Among students who apply to law school, approximately 90% of students gain admission. The college recently added The English Language Institute which is a pre-academic program designed to equip multi-lingual learners with the English and academic skills to be prepared for undergraduate study. The curriculum is centered on the traditional liberal arts education and pre-professional classes. All first-semester freshmen must complete the "First Year Seminar" class, which introduces new students to a variety of lectures, concerts, plays, and trips to museums or galleries based on a different course theme selected each year. In addition to completing an academic major, students must satisfy the college-wide general education requirements, which include classes in the arts, humanities, natural sciences and mathematics, foreign languages, cultural diversity, and academic skills classes including writing, oral communication, quantitative reasoning. Students may choose to complete an academic minor, participate in interdepartmental concentrations, or to focus on an intra-departmental emphasis. Additionally, all students must complete a physical education requirement, amounting to one full semester class, making W&J one of the few liberal arts colleges without a physical education major to have such a requirement. The college maintains a number of combined degree programs, allowing students to attend graduate or professional school in lieu of senior year. The college follows the 4–1–4 academic calendar, which includes a four-month fall term, a three-week Intersession term in January, followed by a four-month spring term. During the Intersession term, students have the choice of studying abroad, completing an external internship, or taking a specially-designed Intersession course. These Intersession courses are more focused than regular courses and provide professors with an opportunity to teach non-traditional subjects. Past Intersession courses have included "Emerging Diseases: Global and Local" in the biology department, "Corporate Failures, Frauds, and Scandals" in the business department, and "Vampires and Other Bloodsuckers" in the English department, "Holocaust Survivor Narratives" in the German department, and "Alternative Radio" in the communications department. At various times, the faculty organizes an "Integrated Semester," where professors organize regular departmental courses, specialized projects, and public events dealing with a common interdisciplinary theme. Students participating in more than two designed courses receive a transcript designation noting their participation in the program. Past themes have included "Integrated Semester on Asia," "The Importance of Place," "Integrated Semester on the Spanish-Speaking World." Students can also pursue international education through 30 pre-approved programs in over 20 countries. While W&J has not had a Reserve Officers' Training Corps (ROTC) program since 1991, the college has a relationship with the University of Pittsburgh's Army and Air Force ROTC programs, allowing W&J students to prepare for an active or reserve commission following graduation. Members of the National Guard of the United States may take online classes to earn an associate's degree in Information Technology Leadership or a certificate in Information Management and Security. Students may undertake externships to gain experiential learning experience in their chosen field. The Franklin Internship Awards, established in 2006 by Ellis Hyman, provide upperclassmen with financial assistance to take an unpaid internship. The college's Magellan Project is a series of programs that provide support and financing for research and independent study projects. Past Magellan Projects have allowed students to study the Invasion of Normandy, Mexican transportation systems, and to volunteer at medical missions in the Dominican Republic. In 2010, the Magellan Project received the Heiskell Award from the Institute of International Education in recognition of the college's progressive approach to study abroad. In the 2010-2011 school year, 58% of W&J students studied abroad. Admission to Washington & Jefferson College is classified as "more selective" by both the Carnegie Classification of Institutions of Higher Education and U.S. News & World Report. The Princeton Review gave Washington & Jefferson an "Admissions Selectivity Rating" of 92. The college extends offers of admission to 38.2% of all applicants. Of all matriculating students, the average high school GPA is 3.34 and 38% are in the top 10% of their high school class. The interquartile range for SAT scores in math and reasoning skills are 510–610 and 520–620, respectively. In 2009, the college developed an SAT-optional admissions program. In the 2019 U.S. News & World Report college rankings, Washington & Jefferson is ranked #103 of all liberal arts colleges in the nation, placing it within "Tier 1." In Forbes Magazine's List of America's Best Colleges for 2010, the college was ranked #100 out of the nation's institutions of higher education. The Washington Monthly ranked the college #132 among all American liberal arts colleges in terms of social mobility, research, and community service. The rankings listed the college as #30 in the nation in terms of Federal Work-Study Program money spent of community service. As president of the college, Tori Haring-Smith has specifically criticized the U.S. News & World Report rankings system, noting that the "financial resources" portion of the rankings formula favors colleges that have higher tuition, even without providing any educational benefits, saying that this has harmed the college's ranking because it charged $5,000 to $7,000 less in tuition that its peer institutions. She also questioned the "peer assessment" portion of the rankings and suggested that college presidents are rarely aware of educational improvements in their peer institutions; she noted that Washington & Jefferson College's ranking has remained the same for a number of years, even while the college made significant improvements acceptance rates and overall selectivity, the addition of academic programs, and the construction of additional buildings. Haring-Smith's criticism of the rankings spurred Bob Morse, the founder of the U.S. College Rankings system to respond to the criticisms directly in an article. She has signed the "Presidents Letter," a nationwide movement asking fellow college presidents to decline participation in the U.S. News & World Report reputation survey, a subjective evaluation where college administrators score their competition. As of 2010, the student body totaled 1,519 students. The 2010 graduating class, which totaled 351 students, was the largest in the college's history. The student body is highly residential, with 98% of students residing in campus housing. The number of transfer students joining the student body each year is relatively low, compared to other institutions. Approximately 18% of the student body receives federal Pell Grants. Prior to entering college, 82% of the student body attended public high schools. Roughly 86% of the each freshman class returns to the college for their sophomore year. The overall graduation rate is 70% About 25 to 30% of each incoming class is the first in their family to attend college. The male to female ratio is 54% to 46%. Like the population of Pennsylvania and the United States as a whole, the largest ethnic group at the college is White American, making up about 82% of the student population. Roughly 10% of the student population does not specify their ethnicity. Other ethnicities, including African American, Asian American, Native American, and Hispanic Americans collectively comprise about 6% of the student body. International students make up 2.05% of the student body. In 2006, Men's Fitness named W&J the "14th Fittest College in America," a ranking that weighed the college's fitness offerings and the student body's culture of fitness and behavior. In 2009, the college was named to the President's Higher Education Community Service Honor Roll, in recognition of the student body's commitment to community service. The college's spends 22% of its Federal Work-Study Program funds on community service projects. The college has joined the YES Prep School IMPACT Partnership Program to provide support to low-income students from the YES Prep Public Schools. The campus of Washington & Jefferson College is located in the city of Washington and the East Washington Borough, small-town communities about 30 miles (48 km) south of Pittsburgh. The 60-acre (24 ha) campus is home to more than 40 academic, administrative, recreational, and residential buildings. 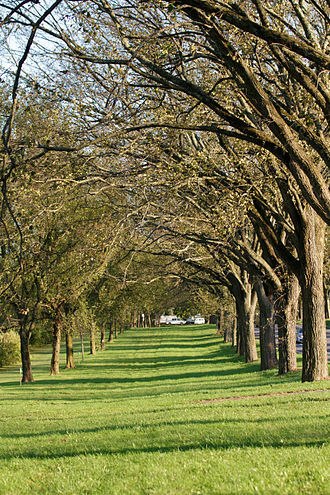 The northern edge of campus is bound by East Walnut Street, the western edge by South College Street, the southern edge by East Maiden Street, and the eastern edge by South Wade. Portions of the campus extend into the East Washington Historic District. Four historic gates mark four traditional entrances to campus at East Maiden Street, Wheeling Street, South College Street, and Beau Street. In 1947, the Pennsylvania Historical and Museum Commission installed a historical marker noting the historic importance of the college. The oldest surviving building is McMillan Hall, which dates to 1793 and is the oldest college building west of the Allegheny Mountains. The main academic building is Old Main, which is topped with two prominent towers. The Old Gym houses a modern exercise facility. McIlvaine Hall, which was originally home to a female seminary, was demolished in 2008 and replaced by the Swanson Science Center. Davis Memorial Hall was once a dormitory and private house. The Thistle Physics Building, the Lazear Chemistry Hall, and the Dieter-Porter Life Sciences Building all cater to the scientific curriculum. The Burnett Center and its sister building, the Technology Center, were built in the late 1990s and early 2000s. The first dormitory on campus was Hays Hall. Wade House, Carriage House, and Whitworth House are Victorian homes housing older students. The recently constructed Chestnut Street Housing complex provides housing for the college's Greek organizations. The Presidents' Row is a cluster of ten buildings in the center of campus, several of which are dedicated to theme housing. Two sister dormitories, New Residence Hall and Bica-Ross Hall, feature suite-style living arrangements. Mellon Hall houses female freshman, and Upperclass Hall houses male freshmen. Other dormitories include Alexander Hall, Beau Hall, Marshall Hall, North Hall, and Penn House. The college administration utilizes several buildings, including the Admissions House, the Alumni House, and the President's House, which are all modified Victorian homes. The U. Grant Miller Library is the modern library; its predecessor, Thompson Hall, is now used for administrative purposes. The Hub, The Commons, and the Rossin Campus Center provide recreational and dining facilities for students. The athletic and intramural teams utilize Cameron Stadium for football and track. The Henry Memorial Center is used for basketball, wrestling, swimming, and volleyball. Other athletic facilities include Brooks Park, Ross Memorial Park and Alexandre Stadium, and the Janet L. Swanson Tennis Courts. W&J competes in 23 intercollegiate athletics at the National Collegiate Athletic Association (NCAA) Division III level. As of the 2009–10 academic year, the Presidents have won more than 108 Presidents' Athletic Conference (PAC) championships, 40 students were selected as conference Most Valuable Player, more than 300 athletes were awarded First Team All-Conference recognition, 75 received All-American honors, and 25 achieved Academic All-American status. During the 2005–2006 season, 34 percent of the student body played varsity-level athletics. W&J's baseball team plays at the all-turf Ross Memorial Ballpark, a site selected to host the 2015 and 2016 NCAA D-III regional tournament. Under the leadership of Coach Jeff Mountain, the Presidents have produced three All-Americans: Shaun Pfeill (3B, 2007); Sam Mann (P/1B; 2007) and Eddie Nogay (Pitcher; 2013). Nogay of Weirton, WV is the school's all-time wins leader with a career record of 28-2. Josh Staniscia of Franklin Regional H.S. is the school's all-time hits leader, with 251 career hits from 2011-2014. Frank Quirin (2008-2010) is the all-time home run leader with 22 career dingers. The intramural sports program is one of the most consistently popular activities at Washington & Jefferson College, providing non-varsity and recreational athletic activities for all students, faculty, and staff of the College. Vicki Staton, a former varsity women's basketball and volleyball coach, manages the intramural program. In 2002, 60% of students participated in intramural sports. In 2006, more than 40% of the student body participated in intramural athletics. In 2007, the intramural activities included 3-on-3 basketball, billiards, bowling, flag football, kickball, tennis, ultimate frisbee, volleyball, wallyball, ping pong, and Texas hold 'em. Intramural champions win a T-shirt celebrating their victory. While the varsity athletics program was struggling during the 1930s, intramural participation topped 84% of the student population. During that time, the management of intramural activities was transferred to the athletic department, allowing the intramural program to use the College's varsity facilities. In the 1930s and 1940s, groups of students competed for the "Big Cup," a trophy given to the most outstanding team, as judged by a cross-sport point system. The history of literary societies at Washington & Jefferson College dates back to the 1797, when the Franklin Literary Society and the Philo Literary Society were founded at Canonsburg Academy. Two other literary societies were founded at Washington College, the Union Literary Society in 1809 and the Washington Literary Society in 1814. Typical early activities include the presentation of dialogues, translations of passages from Greek or Latin classics, and extemporaneous speaking. Later, the literary societies began to present declamations. Each society maintained independent libraries for the use of their members, each of which rivaled the holdings of their respective colleges. These four college literary societies had intense rivalries with each other, competing in "contests", which pitted select society members against another in "compositions, speaking select orations and debating", with the trustees selecting the victor. Because the two colleges never met each other in athletic contests, these literary competitions were the main outlet for their rivalry. In the years after the union of the two colleges, these four literary societies merged with the Franklin Literary Society, which survives today. Washington & Jefferson College is home to a vibrant student art and musical scene. The artistic center of campus is the Olin Fine Arts Center, with an art gallery and a 486-seat auditorium. On the academic side, the Department of Art offers majors in studio art and art education, as well as a concentration in graphic design. The Department of Music offers majors and minors in music. The Department of Theatre and Communications offers a major and minor in theatre. Current musical organizations include the W&J Wind Ensemble, the W&J Jazz Ensemble, the W&J Choir and the Camerata Singers. Former musical organizations include the Banjo, Mandolin & Guitar Club and the College Band. Every year since 2003, the Theatre and Communication Department has produced the Winter Tales series, an annual production of one-act plays written by members of the W&J community, students, alumni, faculty, administration, and staff, and produced by the W&J Student Theater Company. In addition to student-produced art and music, the College provides a number of opportunities to view art and music from the larger art community. The College holds a collection of paintings by distinguished regional artist Malcolm Parcell, which are displayed in several locations on campus. The most prominent location is the Malcom Parcell Room in The Commons, which is part of the student dining area. The W&J Arts Series is an annual collection of musicians, singers, and other artistic performers appearing at the Olin Fine Arts Center. Past shows have included Di Wu, Habib Koité, Chris Potter, The Aquila Theatre Company presenting The Invisible Man, Eroica Trio, Oni Buchanan, Tommy Sands, Cavani String Quartet, Sergio and Odar Assad, and Sandip Burman. In 1999, billionaire W&J alum and well-known opera philanthropist Alberto Vilar sponsored the Vilar Distinguished Artist Series, which brought a number of world-class classical performers to perform at the Olin Fine Arts Center at no cost to students. During its run, the Vilar Distinguished Artist Series hosted, among others, Lorin Maazel conducting the Bavarian Radio Symphony Orchestra, conductor Valery Gergiev conducting the Kirov Orchestra, Camerata Salzburg with Murray Periaha, St. Petersburg Classic Ballet, Vienna State Opera Ballet, Salzburg Mozarteum Orchestra, Susan Graham, Jennifer Larmore, Samuel Ramey, Barbara Bonney, Katia and Marielle Labèque, Angelika Kirchschlager, Simon Keenlyside, Gil Shaham, and Jessye Norman. In 2003, amid Vilar's falling fortunes during the stock market decreases in 2001 and 2002, the Vilar Distinguished Artist Series went on a temporary hiatus. Vilar's 2005 indictment for financial fraud ended any possibility of reviving the arts series. In Fall 2003, the W&J Arts Series, the college's other art series, was expanded to partially compensate for the loss. The Student Government Association organizes the annual Fall Concert and Spring Concert, which bring popular musical acts to campus. Past Spring and Fall concerts have included Cobra Starship, Girl Talk, N.E.R.D. New Found Glory, Saves the Day, and local favorite The Clarks. With 43% of women and 40% of men of the student body participating in Greek life, fraternities and sororities play a significant role in student life at W&J. The Princeton Review named Washington & Jefferson College 12th on their 2010 list of "Major Frat and Sorority Scene" in the United States. As of 2010, the Office of Fraternity & Sorority Life recognized 6 fraternities, Alpha Tau Omega, Beta Theta Pi, Delta Tau Delta, Phi Delta Theta, Phi Gamma Delta, and Phi Kappa Psi, and four sororities, Delta Gamma, Kappa Alpha Theta, Kappa Kappa Gamma, and Pi Beta Phi. The fraternities are governed by a local Interfraternal Council and the sororities are governed by a local Panhellenic Council, while the Greek Judiciary manages broad policy violations at the chapter-level. All Greek organizations occupy College-owned houses on Chestnut Street on campus. All members of fraternities and sororities must pay the $100 "Greek Membership Fee", a levy designed to fund leadership seminars and other educational events for Greeks. Two national fraternities were founded at Jefferson College, Phi Gamma Delta in 1848 and Phi Kappa Psi in 1852. Together, they are collectively known as the Jefferson Duo. A third fraternity was founded at Jefferson College, Kappa Phi Lambda, but it dissolved after a decade of existence amid a dispute between chapters. In 1874, a fourth fraternity was founded at W&J, the short-lived Phi Delta Kappa. The new fraternity grew to several chapters before falling apart in 1880. Students may organize new clubs by presenting a constitution and a list of members to the college administration and the student government for approval. This approval process does not authorize any club to act on behalf of the college, nor does approval indicate any the college's agreement with the club's purpose. The college recognizes over 70 student clubs on campus. A number of student clubs are dedicated to encouraging interest is a specific academic discipline, including the "W&J Denominators" mathematics club, the Society of Physics Students, and the Pre-Health Professions Society. Others are organized along ethnic and cultural lines, including the Black Student Union and the Asian Culture Association. Both major American political parties have chapters at the college, in the form of the "W&J College Democrats" and the Young Republicans. Some clubs take the form of non-varsity athletic teams, including the Men's Rugby Club, the Women's Rugby Club, the Equestrian Club, Men's Volleyball Club and the Ultimate Frisbee Club. Several clubs create volunteer opportunities though Big Brothers/Big Sisters and the United Way. Many religious faiths are represented, including the Hillel Society, Newman Club, and the Student Christian Association. Many other clubs encourage interests in various academic and non-academic activities, including the Green Club (the College's environmental club), the Outdoors Club, and others which are mainly inactive like the Bottega Art Club, the Franklin Literary Society, and the Chess Club. Student media offerings at Washington & Jefferson College include a college newspaper, a college radio station, a yearbook, and a student-edited literary journal. All students, regardless of academic major, are eligible to contribute to these media organizations. Founded in 1909, the Red & Black student newspaper has a weekly circulation of 1,250 copies. The student staff handles all aspects of the production, including writing, editing, graphic design, layout, and advertising sales. The Red & Black features local and national news, student opinion, and college athletics coverage. During the 1860s, students published a satirical newspaper called The Bogus Tract. The college radio station, WNJR broadcasts on the FM broadcast band. Assisted by a faculty advisor from the Department of Theater and Communication, the student-run studio broadcasts in a freeform format with both nationally syndicated programs and Pittsburgh-based independent programs. Student on-air personalities produce radio programs including music, news, talk, and sports. It serves the Pittsburgh Designated Market Area, reaching north to the northern Pittsburgh suburbs, east to Monessen, south to Waynesburg and west to the West Virginia Panhandle. The Wooden Tooth Review is a student-edited literary journal, featuring short fiction and poetry submitted by members of the student body. The editorial board is organized as a recognized student club, with a faculty advisor. The journal was founded in 1999, with V. Penelope Pelizzon, Coordinator of Creative Writing, serving as the first faculty advisor. The college's yearbook, Pandora, is produced annually by a student staff. The college offers "Theme Community Living," where students with common interests live in a single living unit. Past themes have included the "Intensive Study," the "Service Leadership Community," the "International House," "Music House," the "WashPA Radio Theme Community" for students who participate in the WNJR college radio station, and the "Pet House". Students proposing a theme community must develop an educational plan centered on the theme. The Pet House, which allows students to bring their pets to campus, has been located in Monroe Hall in Presidents' Row. Not all types of pets are permitted, only permits students to bring cats, small dogs, small birds, hamsters, gerbils, guinea pigs, and fish. Further, students may only bring pets that they have owned for over one year and be over the age of one and one half, to avoid the problem of impulse purchases and abandonment of pets. The college began the pet house program in 2006, and is one of a dozen schools nationwide to have such a program. The Pet House has been profiled in The New York Times, the USA Today, Observer-Reporter, and KDKA. Several old Victorian houses, named Whitworth Hall and Wade Hall, are used as women's dorms and are slightly isolated from the other dormitories. Many students are also housed in the Greek houses on Chestnut Street, all of the Greek organizations on campus occupy houses owned by the college. The college's dining services has made efforts to use locally grown foods. One of the oldest traditions at Washington & Jefferson College was the "Freshman Rules," a system of rules and restrictions on freshmen. Failure by freshmen to follow these rules would subject them to beatings by upperclassmen or other punishments doled out by the "Freshman Court." During the 1870s and 1880s, the students engaged in organized athletic competitions, pitting the freshman versus sophomore classes in the "Olympic Games" that involved elaborate opening ceremonies and the smoking of a "Pipe of Peace." Another form of physical contest between the freshman and sophomore classes were the annual "color rush," where the teams fought over control over strips of fabric, the "pole rush," where the teams battled to raise a flag up a flagpole, and the "cane rush" where the teams fought over control over a ceremonial cane. These contests generally devolved into outright gang violence. The college cheer, Whichi Coax, is so pervasive in college history and culture that in addition to being shouted during academic ceremonies and football games, it is also used as a salutation in correspondence between alumni. The college's fight song, "Good Ole W&J" is sung to the tune of "99 Bottles of Beer" and makes fun of a number of rival colleges, including the University of Pittsburgh, but was modified sometime before 1958 to laud Washington Female Seminary. For a large portion of the college's history, there was no official alma mater, but there were a number of other tradition hymns and songs. The college's coat of arms features a two-part shield based on the coats of arms of the Jefferson and Washington families. The top portion, showing two towers, representing Washington College and Jefferson College, and three stars, representing the McMillan, Dod, and Smith log cabins. The lower portion, showing a saltire, is adapted from Jefferson's coat of arms and the colors, red and black, is taken from the Washington coat of arms. The coat of arms may appear with a banner underneath showing the college motto. The design was adopted in 1902 in celebration of Jefferson College's centennial. It was designed by Rev. Harry B. King, class of 1891. Upon its adoption, it was described as "a happy combination, and makes a very neat appearance when worn as a pin or button." The college seal displays two brick towers, with one labeled "1802," representing Jefferson College, and the other labeled "1806," representing Washington College. The union of the two colleges is represented by a bridge between the two towers, with Roman numerals reading 1865, the year of union. Banners hanging from the towers show the college motto of "Juncta Juvant." The creation of the seal is unknown, with the first known use occurring during the 1902 centennial celebration of Jefferson College's founding. The seal is used in official documents, including diplomas and certificates. The college's current logo features a stylized version of the two towers of Old Main, symbolizing the 1865 unification of Washington College and Jefferson College. The logo may be displayed in several versions: with the entire name of the college, the shortened form of "W&J", or without any text. Prior to the adoption of this logo, the college's graphic identity consisted of a variety of conflicting logos and type styles. Relations between the city of Washington, Pennsylvania and Washington & Jefferson College span over two centuries, dating to the founding of both the city and the college in the 1780s. 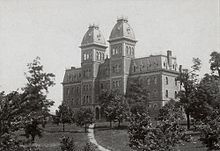 The relationship between the town and college was strong enough that the citizens of Washington offered a $50,000 donation in 1869 to the college in a successful attempt to lure the trustees to select Washington over nearby Canonsburg as the consolidated location of the college. However, the relationship was strained through most of the 20th century, as the college pursued an expansion policy that clashed with the residential neighborhood. The college's frustrations grew after preservationists unsuccessfully attempted to pass laws prohibiting the college from demolishing certain buildings that were listed on the East Washington Historic District. Relations were so bad that residents and college officials engaged in a shouting match at a meeting. Local preservationists also unsuccessfully tried to block the demolition of Hays Hall, which had been condemned. In the 1990s, the city of Washington made several unsuccessful attempts to challenge the college's tax-exempt status. 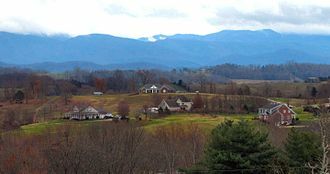 In 1993, Washington appealed the Washington County Board of Assessment's determination that the college was exempt from the city's property tax. That case went to the Pennsylvania Supreme Court, which ruled in favor of the college. In response, the Pennsylvania General Assembly passed a new law clarifying that colleges were exempt from taxation, including from local property taxes. Separately, the city of Washington passed an ordinance that levied a municipal "service fee" against the College students, which was ruled to be illegal and was struck down. In the late 1990s, the college and town tried to mend fences through the Blueprint for Collaboration, a plan with detailed goals and benchmarks for the future to help the college and the city work together on economic development, environmental protection, and historic preservation. James G. Blaine served as U.S. Congressman, Speaker of the House, U.S. Senator, Secretary of State, and almost won the 1884 presidential election. As of 2009, Washington & Jefferson College had about 12,000 living alumni. Before the union of the two colleges, Washington College graduated 872 men and Jefferson College graduated 1,936 men. These alumni include James G. Blaine, who served in Congress as Speaker of the House, U.S. Senator from Maine, two-time United States Secretary of State and the Republican nominee for the 1884 presidential election. 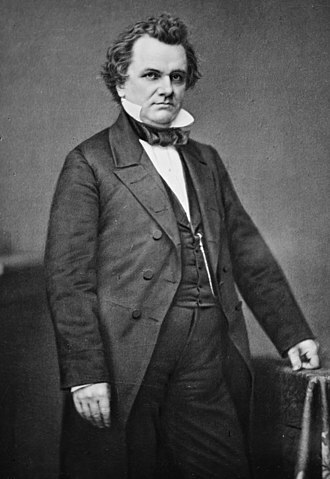 Other graduates have held high federal positions, including United States Secretary of the Treasury Benjamin Bristow and United States Attorney General Henry Stanbery, who successfully defended Andrew Johnson during his impeachment trial. As a U.S. Congressman, Clarence Long was a key figure in directing funds to Operation Cyclone, the CIA's effort to arm the mujahideen in the Soviet–Afghan War. James A. Beaver served as Governor of Pennsylvania and as acting president of the Pennsylvania State University; he is the namesake of Beaver Stadium. William Holmes McGuffey authored the McGuffey Readers, which are among the most popular and influential books in history. Thaddeus Dod's student, Jacob Lindley, was the first president of Ohio University. Astronaut and test pilot Joseph A. Walker became the first person to enter space twice. Other graduates have gone on to success in professional athletics, including Buddy Jeannette, a member of the Basketball Hall of Fame, and Pete Henry, a member of both the College and Pro Football Hall of Fame. Roger Goodell has served as the Commissioner of the NFL since 2006. Among graduates who entered the medical field, Jonathan Letterman is recognized as the "Father of Battlefield Medicine." William Passavant is recognized as a saint within the Lutheran Church. James McGready, who studied with Joseph Smith and John McMillan was a leading revivalist in the Second Great Awakening. Successful graduates in the business realm include Richard Clark, President and CEO of Merck, John S. Reed, the former chairman of Citigroup and the New York Stock Exchange. Coleman, Helen Turnbull Waite (1956). Banners in the Wilderness: The Early Years of Washington and Jefferson College. University of Pittsburgh Press. OCLC 2191890. Archived from the original on 2016-01-08. ^ "U.S. News 2019 National Liberal Arts College Rankings". U.S. News & World Report. ^ a b c d "W&J: College Facts". Washington & Jefferson College. Archived from the original on 2009-05-02. Retrieved 2010-03-23. ^ Wickersham, James (1886). A History of Education in Pennsylvania, Private and Public, Elementary and Higher. Lancaster, Pennsylvania: Inquirer Publishing Company. pp. 400–401. Retrieved 2010-09-12. 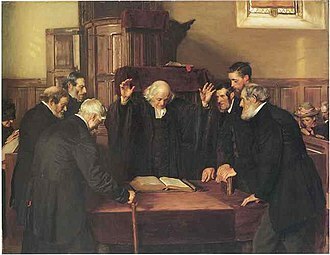 ^ "Jonathan Edwards (1866–1869)". U. Grant Miller Library Digital Archives. Washington & Jefferson College. 2003-09-04. Retrieved 2010-06-03. ^ "James I. Brownson (Pro Tem. 1870)". U. Grant Miller Library Digital Archives. Washington & Jefferson College. 2003-09-04. ^ "Samuel J. Wilson (Pro Tem. 1869)". U. Grant Miller Library Digital Archives. Washington & Jefferson College. 2003-09-04. ^ "George P. Hays (1870–1881)". U. Grant Miller Library Digital Archives. Washington & Jefferson College. 2003-09-04. Retrieved 2010-06-02. ^ "James D. Moffat (1881–1915)". U. Grant Miller Library Digital Archives. Washington & Jefferson College. 2003-09-04. Retrieved 2010-07-22. ^ "Frederick W. Hinitt (Pro Tem. 1915-1918)". U. Grant Miller Library Digital Archives. Washington & Jefferson College. 2003-09-04. ^ "William E. Slemmons (Pro Tem. 1918-1919)". U. Grant Miller Library Digital Archives. Washington & Jefferson College. 2003-09-04. ^ a b c d "Simon Strousse Baker (1922–1931)". U. Grant Miller Library Digital Archives. Washington & Jefferson College. 2003-09-04. Retrieved 2010-07-22. ^ "Samuel Charles Black (1919–1921)". U. Grant Miller Library Digital Archives. Washington & Jefferson College. 2003-09-04. ^ a b "Strike Won". Time. 1931-05-25. Retrieved 2010-09-13. ^ "W. & J. 's Hutchison". Time. 1932-04-11. ^ a b "Ralph Cooper Hutchison (1931–1945)". U. Grant Miller Library Digital Archives. Washington & Jefferson College. 2003-09-04. ^ "Old Gym". U. Grant Miller Library Digital Archives. Washington & Jefferson College. ^ "James Herbert Case, Jr. (1946–1949)". U. Grant Miller Library Digital Archives. Washington & Jefferson College. 2003-09-04. ^ a b "Boyd Crumrine Patterson (1950–1970)". U. Grant Miller Library Digital Archives. Washington & Jefferson College. 2003-09-04. ^ "Boyd C. Patterson, college President, 86". The New York Times. The New York Times Company. 1988-07-16. ^ a b c d "Howard Jerome Burnett (1970–1998)". U. Grant Miller Library Digital Archives. Washington & Jefferson College. 2003-09-04. ^ "Brian C. Mitchell (1998–2004)". U. Grant Miller Library Digital Archives. Washington & Jefferson College. 2003-09-04. Retrieved 2010-07-22. ^ a b "Science Initiative Details". Washington & Jefferson College. 2008-10-31. Archived from the original on May 27, 2010. Retrieved 2010-05-12. ^ "Congratulations and Welcome to President Haring-Smith". W&J: Inauguration. Washington & Jefferson College. 2004. Archived from the original on June 2, 2010. Retrieved 2010-07-22. ^ "DR. JOHN C. KNAPP NAMED 13TH PRESIDENT OF WASHINGTON & JEFFERSON COLLEGE". W&J. Washington & Jefferson College. 2017. ^ a b c d e "Washington & Jefferson College – Washington, Pennsylvania". Carnegie Classification of Institutions of Higher Education. Carnegie Foundation for the Advancement of Teaching. Retrieved 2010-07-22. ^ "STATEMENT OF ACCREDITATION STATUS – WASHINGTON & JEFFERSON COLLEGE". Middle States Commission on Higher Education. 2010-06-11. Archived from the original on June 10, 2011. Retrieved 2010-07-22. ^ a b "Washington & Jefferson College: Faculty & Class Information". The Princeton Review. Retrieved 2010-07-21. ^ a b c d "W&J Science @ a Glance". W&J Science Initiative. Washington & Jefferson College. Archived from the original on April 21, 2011. Retrieved 2010-07-22. ^ "About our graduates" (PDF). Washington & Jefferson College – Office of Career Services. Archived from the original (PDF) on 2010-07-22. Retrieved 2010-07-22. ^ Trifaro, Emily (Spring 2008). "The Science Initiative: Investing in the Future" (PDF). W&J Magazine. Washington & Jefferson College. Archived from the original (PDF) on June 2, 2010. Retrieved 2010-07-22. ^ Haring-Smith, Tori (Winter 2010). "President's Message" (PDF). W&J Magazine. Washington & Jefferson College. Archived from the original (PDF) on June 2, 2010. Retrieved 2010-07-22. ^ "Pre-law general information" (PDF). PRE-LAW COMMITTEE, Washington & Jefferson College. Archived from the original (PDF) on June 2, 2010. Retrieved 2010-07-22. ^ a b c d e f g h i j k l "Washington & Jefferson College 2008–2010 Catalog" (PDF). Washington & Jefferson College. 2008. Archived from the original (PDF) on June 3, 2010. Retrieved 2010-06-12. ^ "W&J: Additional Courses of Study". Washington & Jefferson. Archived from the original on June 2, 2010. Retrieved 2010-06-11. ^ "College-Wide Requirements". Student Handbook. Washington & Jefferson College. 2010-09-01. Retrieved 2010-09-13. ^ "W&J: Intersession". Washington & Jefferson College. Archived from the original on June 2, 2010. Retrieved 2010-06-12. ^ "Intersession 2007" (PDF). Intersession Catalog. Washington & Jefferson College. Archived from the original (PDF) on May 27, 2010. Retrieved 2010-06-12. ^ "Intersession 2008" (PDF). Intersession Catalog. Washington & Jefferson College. Archived from the original (PDF) on 2010-05-27. Retrieved 2010-06-12. ^ a b c "W&J: Integrated Semester". Washington & Jefferson College. Archived from the original on June 2, 2010. Retrieved 2010-06-12. ^ "W&J: Spring Term Offerings – Spring 2010". Washington & Jefferson College. Archived from the original on June 2, 2010. Retrieved 2010-06-12. ^ "W&J: The Integrated Semester: Spring 2008". Washington & Jefferson College. Archived from the original on May 27, 2010. Retrieved 2010-06-12. ^ "ROTC—A Cross-Town Venture" (PDF). W&J Magazine. Washington & Jefferson College. Summer 2002. Archived from the original (PDF) on September 17, 2006. Retrieved 2010-09-13. ^ "W&J: National Guard Program". Washington & Jefferson College. Archived from the original on August 11, 2007. Retrieved 2010-09-13. ^ "W&J: Internships". Washington & Jefferson College. Archived from the original on June 2, 2010. Retrieved 2010-06-12. ^ "W&J: Franklin Internship Awards". Washington & Jefferson College. Archived from the original on 2011-01-04. Retrieved 2010-06-12. ^ "W&J: Magellan Project". Washington & Jefferson College. Archived from the original on June 2, 2010. Retrieved 2010-06-12. ^ "W&J: Magellan Project—Previous Recipients". Washington & Jefferson College. Archived from the original on June 2, 2010. Retrieved 2010-06-12. ^ "2010 Heiskell Award Winner: Study Abroad - Washington & Jefferson College - The Magellan Project". Institute of International Education. 2010. Archived from the original on January 12, 2015. Retrieved January 11, 2015. ^ "W&J Ranks High in Percentage of Students Who Study Abroad". Washington & Jefferson College. November 13, 2012. Archived from the original on April 3, 2013. Retrieved February 20, 2015. ^ a b c d "Overview : Washington and Jefferson College". Best Colleges 2010. U.S. News & World Report. 2010. Retrieved 2010-03-23. ^ a b c d e "Washington & Jefferson College: Admissions". The Princeton Review. Retrieved 2010-07-21. ^ Goodman, Dawn (2009-09-26). "SAT or ACT scores now not problem at W&J". Observer-Reporter. pp. B1. ^ "W&J: Score Optional Policy". Washington & Jefferson College. Archived from the original on May 29, 2010. Retrieved 2010-07-04. ^ "#100 Washington and Jefferson College". Forbes Magazine's List of America's Best Colleges. Retrieved 2010-08-15. ^ a b c d e "College Guide: 2009 Liberal Arts". The Washington Monthly. 2009. Archived from the original on 2009-12-17. Retrieved 2010-07-03. ^ a b Jaschik, Scott (2008-01-17). "Potemkin Rankings". Inside Higher Ed. Retrieved 2010-07-03. ^ Morse, Bob (2008-01-17). "About That Article on Washington and Jefferson College..." U.S. News & World Report. Retrieved 2010-07-03. ^ "Presidents Letter". Presidents Letter. Education Conservancy. 2007-05-10. Retrieved 2010-07-03. ^ a b c d e "Washington & Jefferson College: Student Body". The Princeton Review. Retrieved 2010-07-21. ^ "Pennsylvania Population Estimates 2005". United States Census. 2005. Archived from the original (CSV) on 2007-12-23. Retrieved 2010-07-22. ^ "Largest Class in School History Graduates from W&J". Today @ W&J. Washington & Jefferson College. 2010-05-25. Archived from the original on 2012-07-09. Retrieved 2010-07-22. ^ "Classification Description - Undergraduate Profile Classification". Profile Descriptions. Carnegie Foundation for the Advancement of Teaching. Archived from the original on 2012-07-13. Retrieved 2010-09-09. ^ a b Hanford, Emily. "The YES Prep Story". American Radio Works. Retrieved September 22, 2013. ^ "General Student Body Information: Washington & Jefferson College". Best Colleges 2010. U.S. News & World Report. Retrieved 2010-07-22. ^ Millado, Nate; The Princeton Review. "Fittest Colleges in America". Men's Fitness. Archived from the original on 2010-02-20. Retrieved 2010-07-16. ^ "REPORT CARD: Washington & Jefferson College". Men's Fitness. Archived from the original on 2008-02-26. Retrieved 2010-07-16. ^ "Honor Roll" (PDF). Learn and Serve America. 2009. p. 9. Archived from the original (PDF) on October 15, 2011. Retrieved 2010-07-04. ^ "Washington & Jefferson College Named to Presidential Honor Roll". Today @ W&J. Washington & Jefferson College. 2010-03-02. Archived from the original on 2012-07-08. Retrieved 2010-07-04. ^ Crompton, Janice (March 4, 2010). "Washington & Jefferson joins program to educate underprivileged students". Pittsburgh Post-Gazette. Retrieved September 22, 2013. ^ Miller, Barbara S. (2010-04-01). "Universities, colleges gear up for census". Observer Reporter. Washington, Pennsylvania. Archived from the original on 2010-05-17. Retrieved 2010-05-16. ^ Washington & Jefferson College Campus Map (PDF) (Map) (April 2010 ed.). Office of Communications, Washington & Jefferson College. § Whole. Archived from the original (PDF) on May 27, 2010. Retrieved 2010-05-16. ^ a b Templeton, David (1994-07-24). "W&J President Answers Critics of Expansion". Pittsburgh Post-Gazette. 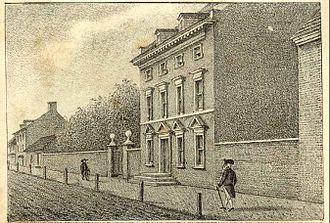 ^ "Maiden, Wheeling, College, and Beau St. entrances". Historic Campus Architecture Project. Council of Independent Colleges. Retrieved 2010-05-16. ^ "Washington and Jefferson College - PHMC Historical Markers". Historical Marker Database. 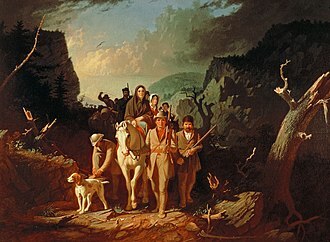 Pennsylvania Historical & Museum Commission. Retrieved December 9, 2013. ^ "McMillan Hall". U. Grant Miller Library Digital Archives. Washington & Jefferson College. Retrieved 2010-07-22. ^ "Old Main". U. Grant Miller Library Digital Archives. Washington & Jefferson College. Archived from the original on 2010-05-22. Retrieved 2010-05-17. ^ "Old Gym". U. Grant Miller Library Digital Archives. Washington & Jefferson College. Retrieved 2010-05-18. ^ "McIlvaine Memorial Hall". Historic Campus Architecture Project. Council of Independent Colleges. Retrieved 2010-05-16. ^ Ramirez, Chris (2010-05-09). "Enrollment inspires expansion at Washington & Jefferson". Pittsburgh Tribune-Review. Archived from the original on 2012-09-06. Retrieved 2010-05-12. ^ "Davis Memorial Hall". Historic Campus Architecture Project. Council of Independent Colleges. Retrieved 2010-05-16. ^ "W&J:Howard J Burnett Center". Washington & Jefferson College. Archived from the original on 2007-07-03. Retrieved 2010-05-06. ^ "W&J: Information Technology Leadership". Washington & Jefferson College. Archived from the original on October 29, 2007. Retrieved 2010-05-10. ^ "Hays Hall". U. Grant Miller Library Digital Archives. Washington & Jefferson College. Archived from the original on 2009-07-17. Retrieved 2010-04-23. ^ a b "Victorian houses (Admissions House and President's House)". Historic Campus Architecture Project. Council of Independent Colleges. Archived from the original on 2011-07-25. Retrieved 2010-05-16. ^ "W&J: Chestnut Street Housing". Washington & Jefferson College. Archived from the original on September 9, 2007. Retrieved 2010-05-16. ^ "W&J: President's Row". Washington & Jefferson College. Archived from the original on September 21, 2006. Retrieved 2010-05-16. 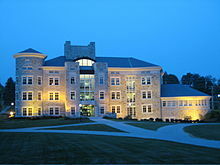 ^ "W&J: New Residence Hall". Washington & Jefferson College. Archived from the original on August 29, 2006. Retrieved 2010-05-16. ^ "W&J: Bica Ross Hall". Washington & Jefferson College. Archived from the original on August 29, 2006. Retrieved 2010-05-16. ^ "W&J: Mellon Hall". Washington & Jefferson College. Archived from the original on August 29, 2006. Retrieved 2010-05-16. ^ "W&J: Upperclass Hall". Washington & Jefferson College. Archived from the original on August 29, 2006. Retrieved 2010-05-16. ^ "W&J: Alexander Hall". Washington & Jefferson College. Archived from the original on August 29, 2006. Retrieved 2010-05-16. ^ "W&J: Beau Hall". Washington & Jefferson College. Archived from the original on August 29, 2006. Retrieved 2010-05-16. ^ "W&J: Residence Halls". Washington & Jefferson College. Archived from the original on December 11, 2008. Retrieved 2010-05-16. ^ "W&J: Library FAQ". About the Library. Washington & Jefferson College. Archived from the original on May 28, 2010. Retrieved 2010-05-18. ^ "Thompson Hall". Historic Campus Architecture Project. Council of Independent Colleges. Retrieved 2010-05-16. ^ "W&J: Cameron Stadium". Washington & Jefferson College. Archived from the original on May 29, 2010. Retrieved 2010-06-30. ^ "W&J: Henry Memorial Center". Washington & Jefferson College. Archived from the original on October 22, 2008. Retrieved 2010-05-18. ^ "W&J: Brooks Park". Washington & Jefferson College. Archived from the original on October 30, 2007. Retrieved 2010-05-15. ^ "Ross Memorial Park/Alexandre Stadium". Washington & Jefferson College. Archived from the original on October 30, 2007. Retrieved 2010-05-18. ^ "W&J: Athletics". Washington & Jefferson College. Archived from the original on June 30, 2010. Retrieved 2010-07-21. ^ Adamski, Chris (2008-03-02). "Washington Sunday: W&J gets revenge, wins league championship". Pittsburgh Post-Gazette. PG Publishing Co., Inc. Retrieved 2010-07-22. ^ "W&J: Intramural Sports". Washington & Jefferson College. Archived from the original on December 21, 2008. Retrieved 2010-04-15. ^ a b c d e f g h DeFrancesco, Joyce (Spring 2006). "Rich in History, Ripe With Promise - Welcome to Jay" (PDF). W&J Magazine. Washington & Jefferson College. pp. 17–21. Archived from the original (PDF) on September 17, 2006. Retrieved 2010-04-15. ^ "Professors Who Inspire" (PDF). W&J Magazine. Washington & Jefferson College. 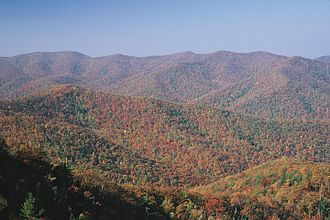 Fall 2008. Archived from the original (PDF) on 2010-05-27. Retrieved 2010-04-15. ^ "Tradition Meets Ambition" (PDF). W&J Magazine. Washington & Jefferson College. Fall–Winter 2002. Archived from the original (PDF) on September 17, 2006. Retrieved 2010-04-15. ^ "Intramural Activities". Washington & Jefferson College. 2007. Archived from the original on May 17, 2007. Retrieved 2010-04-15. ^ Scarborough, David Knowles (1979). "Intercollegiate Athletics at Washington and Jefferson College: the Building of a Tradition". Ph.D Dissertation. Pittsburgh, Pennsylvania: University of Pittsburgh: 113. ^ a b c d e McClelland, W.C. (1903). "A History of Literary Societies at Washington & Jefferson College". The Centennial Celebration of the Chartering of Jefferson College in 1802. Philadelphia: George H. Buchanan and Company. pp. 111–132. ^ Rhees, William Jones (1859). "List of Libraries, Washington, Pennsylvania". Manual of public libraries, institutions and societies in the United States and British provinces of North America. Philadelphia: J. B. Lippincott & Company. p. 637. ^ Scarborough, David Knowles (1979). "Intercollegiate Athletics at Washington and Jefferson College: the Building of a Tradition". Ph.D Dissertation. Pittsburgh, Pennsylvania: University of Pittsburgh: 15. ^ "Organizations at W&J – Franklin Literary Society" (PDF). W&J Magazine. Washington & Jefferson College. Spring 2006. Archived from the original (PDF) on 2006-08-29. Retrieved 2010-04-29. ^ "W&J: Olin Art Gallery". Washington & Jefferson College. Archived from the original on September 1, 2009. Retrieved 2010-05-15. ^ a b Druckenbrod, Andrew (2003-05-06). "Review: Bavarian Radio Symphony Orchestra". Pittsburgh Post-Gazette. Retrieved 2010-05-15. ^ "W&J: Art". Washington & Jefferson College. Archived from the original on October 29, 2007. Retrieved 2010-05-15. ^ "W&J: Department of Music". Washington & Jefferson College. Archived from the original on December 31, 2008. Retrieved 2010-05-15. ^ "W&J: Theatre". Washington & Jefferson College. Archived from the original on October 29, 2007. Retrieved 2010-05-15. ^ "Music Department Concerts". Washington & Jefferson College. Archived from the original on March 7, 2009. Retrieved 2010-05-15. ^ "College Band (1961)". U. Grant Miller Library Digital Archives. Washington & Jefferson College. Archived from the original on 2011-07-29. Retrieved 2010-05-15. ^ "Banjo, Mandolin & Guitar Club". Offsite Digital Storage Facility. U. Grant Miller Library. Retrieved 2010-05-13. ^ "W&J: Past Productions". Olin Fine Arts Center. Archived from the original on May 27, 2010. Retrieved 2010-05-15. ^ a b "Washington & Jefferson College 2008–2010 Catalog" (PDF). Course Catalog. Washington & Jefferson College. 2008. Archived from the original (PDF) on March 27, 2010. Retrieved 2010-05-09. ^ "W&J Arts Series Information". Washington & Jefferson College. Archived from the original on May 27, 2010. Retrieved 2010-05-15. ^ "W&J Arts Series Events". Washington & Jefferson College. Archived from the original on 2011-07-29. Retrieved 2010-05-15. ^ "2006–2007 Arts Series Announced" (PDF). W&J Magazine. Washington & Jefferson College. Spring 2006. Archived from the original (PDF) on September 17, 2006. Retrieved 2010-05-15. ^ a b "2002–2003 Vilar Distinguished Artist Series and 2002–2003 W&J Arts Series" (PDF). W&J Magazine. Washington & Jefferson College. Winter 2002. Archived from the original (PDF) on September 17, 2006. Retrieved 2010-05-15. ^ "Arts Series Announced for 2004–2005" (PDF). W&J Magazine. Washington & Jefferson College. Spring 2004. Archived from the original (PDF) on September 17, 2006. Retrieved 2010-05-15. ^ a b c Druckenbrod, Andrew (2003-07-31). "W&J College to re-evaluate Vilar Distinguished Artist Series". Pittsburgh Post-Gazette. Retrieved 2010-05-15. ^ a b "Vilar Distinguished Artist Series On Hiatus" (PDF). W&J Magazine. Washington & Jefferson College. Summer 2003. Archived from the original (PDF) on September 17, 2006. Retrieved 2010-05-15. ^ Kanny, Mark (2001-12-03). "Review: Russian conductor makes energetic local debut at college". Pittsburgh Tribune Review. Archived from the original on 2013-01-31. Retrieved 2010-05-15. ^ a b Schackner, Bill (2005-06-05). "Philanthropy carries a whiff of scandal". Pittsburgh Post-Gazette. Retrieved 2010-05-10. ^ "Student Activities, Involvement and Leadership, & Student Organizations" (PDF). Resource Manual 2009–2010. Washington & Jefferson College. 2009. Archived from the original (PDF) on June 2, 2010. Retrieved 2010-05-15. ^ "W&J Student Life". Washington & Jefferson College. Archived from the original on May 27, 2010. Retrieved 2010-05-15. ^ "Request your free ticket to this year's SGA Fall Concert!". Washington & Jefferson College. Archived from the original on September 28, 2008. Retrieved 2010-05-15. ^ "W&J: Spring Concert 2006". Washington & Jefferson College. 2006. Archived from the original on September 21, 2006. Retrieved 2010-05-15. ^ "Washington and Jefferson College Student Life". U.S. News & World Report. 2012. Archived from the original on October 12, 2011. Retrieved August 8, 2012. ^ "Social Scene: Major Frat and Sorority Scene". The Princeton Review. 2010. Retrieved 2010-09-21. ^ "W&J: Fraternities". Washington & Jefferson College. Archived from the original on October 30, 2007. Retrieved 2010-04-11. ^ "W&J: Sororities". Washington & Jefferson College. Archived from the original on September 13, 2007. Retrieved 2010-04-11. ^ "W&J: Chestnut Street Housing". Washington & Jefferson College. Archived from the original on September 9, 2007. Retrieved 2010-04-11. ^ Smydo, Joe (2001-10-14). "Major changes afoot for W&J Greek life". Pittsburgh Post-Gazette. Retrieved 2010-04-14. ^ "W&J: Schedule of Tuition, Fees, Room & Board". Washington & Jefferson College. Archived from the original on December 24, 2008. Retrieved 2010-04-11. ^ William Raimond Baird; Brown, James T. (1920). "Phi Gamma Delta". Baird's Manual of American College Fraternities (9th ed.). G. Banta Company. p. 255. OCLC 17350924. ^ Baird, William Raimond; Brown, James T. (1920). 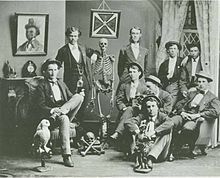 "Phi Kappa Psi". Baird's Manual of American College Fraternities (9th ed.). G. Banta Company. p. 270. OCLC 17350924. ^ "History of Greek Letter Organizations". Phi Gamma Delta. Retrieved 2010-04-26. These two-Phi Gamma Delta and Phi Kappa Psi- comprise the famed “Jefferson Duo”. A third fraternity, Kappa Phi Lambda, also had its genesis at old Jefferson College, where it was established in 1862, spreading to nine other colleges. ^ Baird, William Raimond; Brown, James T. (1920). "Kappa Phi Lambda". Baird's Manual of American College Fraternities (9th ed.). G. Banta Company. p. 737. OCLC 17350924. ^ a b Baird, William Raimond; Brown, James T. (1920). "Phi Delta Kappa". Baird's Manual of American College Fraternities (9th ed.). G. Banta Company. p. 741. OCLC 17350924. ^ a b "College Policy on Campus Organizations" (PDF). Student Activities, Involvement and Leadership, & Student Organizations Resource Manual. Washington & Jefferson College. October 2009. p. 13. Archived from the original (PDF) on June 3, 2010. Retrieved 2010-07-25. ^ a b c d e f g h i j "W&J: Clubs and Organizations". Washington & Jefferson College. Archived from the original on 2010-05-27. Retrieved 2010-07-22. ^ a b "W&J: Student Media". Washington & Jefferson College. Archived from the original on 2006-08-29. Retrieved 2010-07-22. ^ a b c "W&J: Red & Black". Washington & Jefferson College. Archived from the original on 2009-04-19. ^ Coleman, Helen Turnbull Waite (1956). Banners in the Wilderness: The Early Years of Washington and Jefferson College. University of Pittsburgh Press. pp. 154–155. OCLC 2191890. ^ a b c d "A recent history of radio at W&J". Washington & Jefferson College. Archived from the original on 2010-01-14. ^ "W&J: WNJR". Washington & Jefferson College. Archived from the original on 2008-07-09. ^ "Predicted coverage area for WNJR 91.7 FM, Washington, PA". radio-locator.com. Theodric Technologies LLC. 2009. ^ "The Wooden Tooth Review Submission Deadline is Dec. 19". W&J Messenger. Washington & Jefferson College. Archived from the original on 2010-06-02. Retrieved 2010-07-22. ^ "Wooden Tooth Review". WorldCat. Retrieved 2010-07-22. ^ "Editor's Note". The Wooden Tooth Review. Washington & Jefferson College. 10: 0. Spring 2009. Retrieved 2010-07-22. ^ Pelizzon, V. Penelope. "V. Penelope Pelizzon, Associate Professor, Department of English" (PDF). University of Connecticut. Archived from the original (PDF) on 2010-06-11. Retrieved 2010-07-22. ^ "W&J: Pandora". Washington & Jefferson College. Archived from the original on 2006-09-01. Retrieved 2010-07-22. ^ "W&J: Theme Community Living". Washington & Jefferson College. Archived from the original on 2010-05-28. Retrieved 2010-05-16. ^ "W&J: Theme Communities". Washington & Jefferson College. Archived from the original on 2006-08-29. Retrieved 2010-05-16. ^ a b Taylor, Lynda Guydon (2005-11-13). "Home Showcase: In tune with being together – W&J offers living quarters to like-minded music lovers". Pittsburgh Post-Gazette. Retrieved 2010-07-22. ^ a b c "W&J in the News" (PDF). W&J Magazine. Washington & Jefferson College. Fall 2008. Archived from the original (PDF) on May 27, 2010. Retrieved 2010-05-16. ^ "W&J: Pet House Information". Washington & Jefferson College. Archived from the original on 2010-05-28. Retrieved 2010-05-16. ^ a b Peters, Sharon L. (2008-09-23). "Pets take the bite out of dorm life". USA Today. Retrieved 2010-07-22. ^ Steinberg, Jacques (2010-06-04). "Colleges Extend the Welcome Mat to Students' Pets". The New York Times. Retrieved 2010-07-22. ^ "W&J in the News" (PDF). W&J Magazine. Washington & Jefferson. Winter 2007. Archived from the original (PDF) on 2008-06-27. Retrieved 2010-05-16. ^ Conte, Andrew (August 16, 2012). "Effort sprouts to link local diners with local produce". Pittsburgh Tribune-Review. Retrieved April 19, 2007 – via Questia Online Library. ^ Scarborough, David Knowles (1979). "Intercollegiate Athletics at Washington and Jefferson College: the Building of a Tradition". Ph.D Dissertation. Pittsburgh, Pennsylvania: University of Pittsburgh: 16–17. ^ Haring-Smith, Tori (2007-09-03). "2007 Convocation Address". 2007 Convocation Address. Washington & Jefferson College. Archived from the original on 2010-05-28. Retrieved 2010-03-29. ^ a b Haring-Smith, Tori (August 21, 2005). "Matriculation of the Class of 2009". Washington & Jefferson College. Archived from the original on 2006-08-29. Retrieved 2010-03-29. ^ DeFrancesco, Joyce (Spring 2006). "Rich in History, Ripe With Promise - Miscellaneous W&J Traditions" (PDF). W&J Magazine. Washington & Jefferson College. pp. 24–27. Archived from the original (PDF) on September 17, 2006. ^ a b c "W&J: W&J Graphics Standards Guide - Logos and Typefaces". Washington & Jefferson College. Archived from the original on 2006-09-01. Retrieved 2010-07-29. ^ a b c d "The Coat of Arms". The Centennial celebration of the chartering of Jefferson College in 1802. George H. Buchanan and Company. 1903. p. 2. ^ a b c d e f g h i "Symbols of Jay" (PDF). W&J Magazine. Washington & Jefferson College. Spring 2006. p. 20. Archived from the original (PDF) on September 17, 2006. ^ "W&J Graphic Standards Guide – Seal". Washington & Jefferson College. Archived from the original on 2006-09-01. Retrieved 2010-07-24. ^ "History of the City". City of Washington. Archived from the original on May 17, 2010. Retrieved 2010-06-07. ^ Taylor, Davison; Patti Murphy (1991-03-31). "W&J's Building Plans Putting Residents on Guard". The Pittsburgh Press. ^ Templeton, David (1994-08-14). "Group Seeks Anti-Demolition Law". Pittsburgh Post-Gazette. ^ Robertson, Bob (1994-08-21). "E. Washington Demolition Delayed". Pittsburgh Post-Gazette. ^ Robertson, Bob (1994-07-03). "Council Reconsiders W&J Demolition Permit". Pittsburgh Post-Gazette. p. W2. ^ a b City of Washington v. Board of Assessment Appeals of Washington County, Pennsylvania and Washington & Jefferson College , 550 Pa. 175 (Pennsylvania Supreme Court 1997-11-20). ^ Marino, Gigi (September 2004). "What a Ride It Will Be" (PDF). Bucknell World. Bucknell University. Retrieved 2010-07-22. ^ City of Washington v. Washington & Jefferson College , 25 Pa. D. & C.4th 13 (Common Pleas of Washington County, Pennsylvania 1995-06-15). ^ "College and Community Present Cooperative Plan" (Press release). Washington and Jefferson College. 2002-11-22. Archived from the original on 2006-08-29. Retrieved 2010-07-22. ^ "Blueprint for Collaboration Applauded" (Press release). Washington and Jefferson College. 2003-06-26. Archived from the original on 2006-08-29. Retrieved 2010-07-22. ^ "W&J: College Facts". Washington & Jefferson College. Archived from the original on 2009-05-02. Retrieved 2010-02-22. ^ a b "Washington College 1806–1865". U. Grant Miller Library Digital Archives. Washington & Jefferson College. Archived from the original on 2009-05-02. Retrieved 2010-02-22. ^ a b c d e "Jefferson College 1802–1865". U. Grant Miller Library Digital Archives. Washington & Jefferson College. Archived from the original on 2009-05-02. Retrieved 2010-02-26. 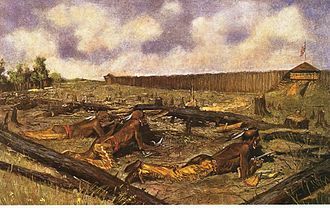 ^ Perrin, William Henry; Battle, J. H.; Kniffin, G. C. (1888). Kentucky: A History of the State. F. A. Battey. p. 569. Retrieved 2009-02-23. ^ "Long, Clarence Dickinson, (1908–1994)". Biographical Directory of the United States Congress. United States Congress. Retrieved 2009-02-23. ^ Musselman, Ron (2008-09-16). "Why is it called Beaver Stadium?". Pittsburgh Post-Gazette. Retrieved 2008-09-17. ^ Eaton, Samuel John Mills; Woods, Henry (1902). "McGuffey, William H.". Biographical and Historical Catalogue of Washington and Jefferson College. Philadelphia: G.H. Buchanan and Company. p. 299. OCLC 2379959. Retrieved 2010-04-04. ^ Beard, Richard (1874). "Rev. 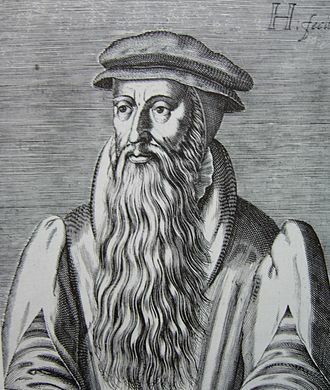 Jacob Lindley, D.D. 1803–1856". Brief Biographical Sketches of Some of the Early Ministers of the Cumberland Presbyterian Church: Second series. Nashville, Tennessee: Cumberland Presbyterian Board of Publication. p. 45. Retrieved 2010-02-23. ^ "NASA – Joseph A. Walker". NASA People. NASA. 2009-09-17. Archived from the original on November 28, 2010. Retrieved 2009-02-23. ^ "Harry E. "Buddy" Jeannette". hoophall.com. Naismith Memorial Basketball Hall of Fame. 2007. Archived from the original on August 31, 2009. Retrieved 2010-02-24. ^ "Wilbur (Pete) Henry". profootballhof.com. Pro Football Hall of Fame. Archived from the original on April 24, 2009. Retrieved 2010-02-24. ^ "W&J: Roger S. Goodell". People Profiles. Washington & Jefferson College. Archived from the original on 2015-02-21. Retrieved February 20, 2015. ^ Beard, Richard (1867). "Rev. James M'Gready". Brief biographical sketches of some of the early ministers of the Cumberland Presbyterian Church. Southern Methodist Pub. House. p. 7. ^ "W&J: Richard T. Clark". People Profiles. Washington & Jefferson College. Archived from the original on 2009-06-23. Retrieved 2010-02-23. ^ "W&J: ,John Reed". People Profiles. Washington & Jefferson College. Archived from the original on February 21, 2015. Retrieved February 20, 2015. The 1922 Rose Bowl was a college football bowl game played on January 2,1922, between the Washington & Jefferson Presidents and the California Golden Bears. The Cal team was favored in this game, causing one sportswriter to say All I know about Washington and Jefferson is that theyre both dead. The 1921 team, coached by Greasy Neale, went 10–0 in the season, defeating powerhouses Pitt, University of Detroit. The 7–0 victory over rival Pitt was celebrated with a day of canceled classes, as the best team from the east, W&J was invited to the 1922 Rose Bowl to play the best team from the west, the undefeated and heavily favored California Golden Bears. The Red and Black could only afford to send 11 men on the cross-country trip, thus, W&J would be the last Rose Bowl team to play the same 11 men the entire game. During the train ride to Pasadena, in which Greasy Neale continued to prepare his men, one player caught pneumonia, another player had secretly stowed away on the train and was given the ill players ticket and roster spot. The Washington & Jefferson Presidents are the intercollegiate athletic teams for Washington & Jefferson College. The name Presidents refers to the two namesakes of the college, George Washington and Thomas Jefferson. During the 2005-2006 season,34 percent of the student body played varsity-level athletics, W&J competes in 24 intercollegiate athletics at the NCAA Division III level. Collectively, the Presidents have won more than 108 Presidents Athletic Conference championships, the development of sanctioned, varsity-level athletics at Washington & Jefferson College began to develop in 1883, when the student body began agitating for more formal athletic programs. Many other schools had developed athletic programs by that time and advocates felt that a more formal athletic program would increase school spirit, in 1890, students formed the Athletic Association, charging the 75 members a $1 membership fee that went to fund athletics. By a vote, the students selected cardinal and black to be the colors, as the preferred scheme of navy. An oil strike was discovered on the Old Fairgrounds, which helped finance the renovation of that facility into the College Field, at that meeting, Linton expressed a desire for the student athlete to be relieved of the incubus of the professional coach. In 1910, the program was in danger of being dissolved due to crushing debt. The Student Athletic Committee proposed a $1 per term student fee to fund the team, team manager and beloved student solicitor Robert M. Murphy, was able to convince the students to accept the fee. However, the Faculty Athletic Committee balked, vetoing the new rules, wells highlighted the growing tension between athletics and academics. As orchestrated by a group of football supporters, the two professors were brought before a faculty committee for not having the requisite support for the athletic programs. During the Presidency of Simon Strousse Baker, the Student and Faculty Athletic Committees were heavily in debt, the gate receipts for football games, the Committees main source of income, had fallen as the team began to lag behind the larger schools it traditionally played. John McMillan was a prominent Presbyterian minister and missionary in Western Pennsylvania when that area was part of the American Frontier. He founded the first school west of the Allegheny Mountains, which is now known as John McMillans Log School and he is one of the founders of Washington & Jefferson College McMillan was born on November 11,1752 in Faggs Manor, Chester County, Pennsylvania. His Scots-Irish parents arrived in Chester County from County Antrim, Ireland in 1742, McMillan attended Blairs grammar aschool in Faggs Manor and studied theology at Robert Smiths Pequea Academy He entered Princeton at 18 and graduated in 1772. It was Princeton that he declared that the law was not only holy and just but that it was good. He was licensed to at age 22 in East Nottingham, Pennsylvania under the Presbytery of Newcastle and he traveled west on foot in 1775, preaching along the way. On 1776 August 6 he married Catherine Brown of Chester County and he founded Pigeon Creek Church, where he served for 19 years, Chartiers Church, where he served for 47 years and 8 years with Matthew Brown. The precise date of the beginning of instruction is unknown, McMillan was described as large man, with a height of 6 foot and weighing 200 pounds in his middle age. His voice was described as strong and swarthy and he was a Federalist and opposed the Whiskey Rebellion. He nominated Albert Gallatin for congress, gallatins successor, James Ross was a classical teacher at McMillans log college. McMillan served in the militia in Captain James Scotts Company of the Third Battalion of the Washington County Military and he was ordered to duty on May 8,1782 and received donation farm in Mercer County from the government for his service. He was related to Captain William Fife who was a captain during the Revolutionary War from western Pennsylvania, McMillan and Rev. Matthew Henderson collected money to build the Canonsburg Academy in Canonsburg and transferred his log cabin students there. He is considered a founder of the Pittsburgh Academy (later University of Pittsburgh as well as the Pittsburgh Xenia Theological Seminary, all told, he educated over 100 ministers and preached 6,000 sermons. David Bradford was a successful lawyer and deputy attorney-general for Washington County, Pennsylvania in the late 18th century. He was infamous for his association with the Whiskey Rebellion, and he was pardoned by President John Adams for his actions. Today, his familys home in Washington, Pennsylvania is a national landmark, throughout the early 18th century, what is now Washington County was claimed by both Virginia and Pennsylvania. It wasnt until March 28,1781 the drawing of the Mason–Dixon line officially gave this land to Pennsylvania, Washington County was erected out of Westmoreland County at that time, and Washington, the county seat, was laid out by David Hoge that same year. The following year,1782, David Bradford, who was born in Maryland about 1760, court records indicate that in April 1782 he was the sixth attorney to be admitted to the Washington County Bar Association. A brilliant young lawyer, he established a very successful practice. David Bradford had important family connections in town, one of his sisters, had married John McDowell, a prominent local attorney, another sister, had married Col.
James Allison, a lawyer who had settled in the Chartiers Valley in 1774. Both McDowell and Allison were elders in the Rev. John McMillans Chartiers Church, David Bradford joined his brothers-in-law as a trustee of Washington College, and was appointed a member of the building committee. 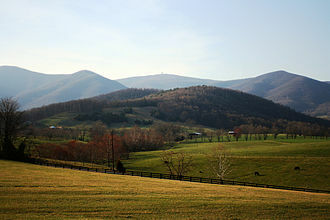 President George Washington ordered 13,000 troops to the Washington, when the militias arrived in Parkisons Ferry, they began arresting suspected rebels. Among those who had warrants out for their arrest was Bradford, according to Harriet Brantons book, David Bradford and His House, Bradford was at home on October 25,1794, when he was warned of the approach of a cavalry unit with orders to capture him. Bradford leaped from a window of his house onto his waiting horse. 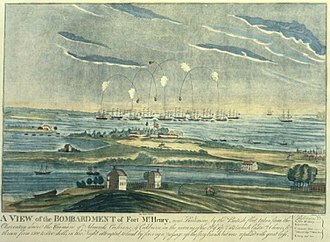 With the soldiers in hot pursuit of him, Bradford made it to McKees Rocks, a touch-and-go gun battle with his pursuers went on all night but he managed to slip through by staying close to the opposite shore of the river. The next night Bradford encountered the skipper of a keelboat who was fleeing the region for his part in the rebellion. The F. Julius LeMoyne House serves as the headquarters of the Washington County Historical Society. McGuffey's grave obelisk at the University of Virginia Cemetery in Charlottesville, Virginia. The "Old College" in 1899, still in its original location. The "New College" around 1850. McMillan Hall is visible on the right.